There may be affiliate links in this post which means I may receive a commission if you purchase something through a link. However, please be assured that I only recommend products I have personally used and love! 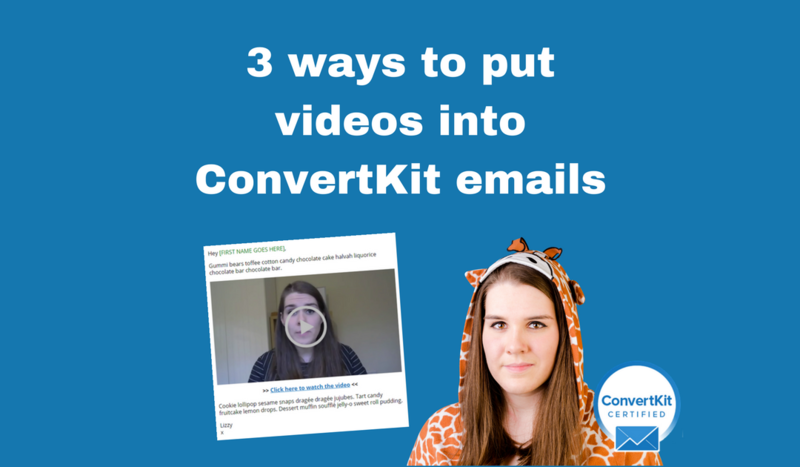 Unfortunately, it’s not possible to embed videos straight into ConvertKit. Even if it looks like it works in the browser preview, I promise you it doesn’t work when you actually send it. To avoid embarrassing, messy emails, I recommend you take a quick read of my blog post: How to get your formatting nice in ConvertKit emails. That said though, there are certainly occasions where it may make more sense to link them straight to the YouTube video or the Facebook Live recording. When I was doing a MailChimp to ConvertKit migration recently, I noticed that MailChimp creates these nice little helpful preview images with nice overlay ‘play’ buttons. So I tried saving it and putting it into a ConvertKit email. It totally works! If you’re using one of the above suggestions for including videos in your ConvertKit emails, make sure you also include a text link to the video. Why? Because some people have pictures turned off when they view their emails, and if the only link to the video was a picture… then you could have an awkward white space on your hands. You may also like my blog post: How to put a video on a ConvertKit Landing Page! I hope you found this blog post useful. Please do let me know in the comments if you’re using video in your business or part of your marketing strategy! I love to see creative ways people set out their ConvertKit emails! Yes the embed on your site instead of leading them to youtube is excellent advice! I like the idea of sending them to my website. Do I use a private page? Depends what the video is for! I’d usually be sending them to just a regular page or a blog post or something. But you can also do a private page or a password protected page. Thank you for your response. I should have been more specific. I want to do a video mini-course as my lead magnet. I was thinking they would opt-in and then get each video link by email. Since it is the opt-in I would want a private page I think. Yeah, a private page sounds like a good idea. You can either use a page that’s not linked in a menu anywhere, or you can ‘hide’ it from Google with a plugin like YoastSEO (if you have a WordPress site, not sure about other site types).